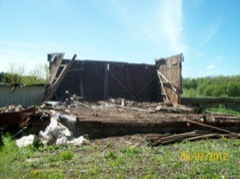 Deconstruction: Stage IV - Disassembly and salvage of the remaining standing structure (beams, studs and siding). I haven't decided what to do with all this. At this point I would like to re-build a 'smaller' version of this barn - either on the same site or nearby. It could be used as a workshop. I hope I have the time and the energy. This is how 2011 ended. There is still a lot of work to do here. 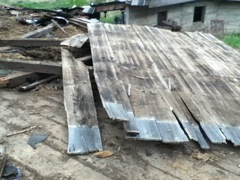 All of the old roof needs to be cleared away; shingles, beams, and roof boards separated and either saved or disposed of. (remember to click on image to view a large version). 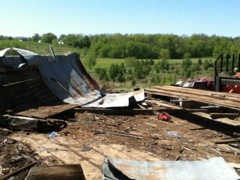 As you see, the roof broke into sections as it came down. 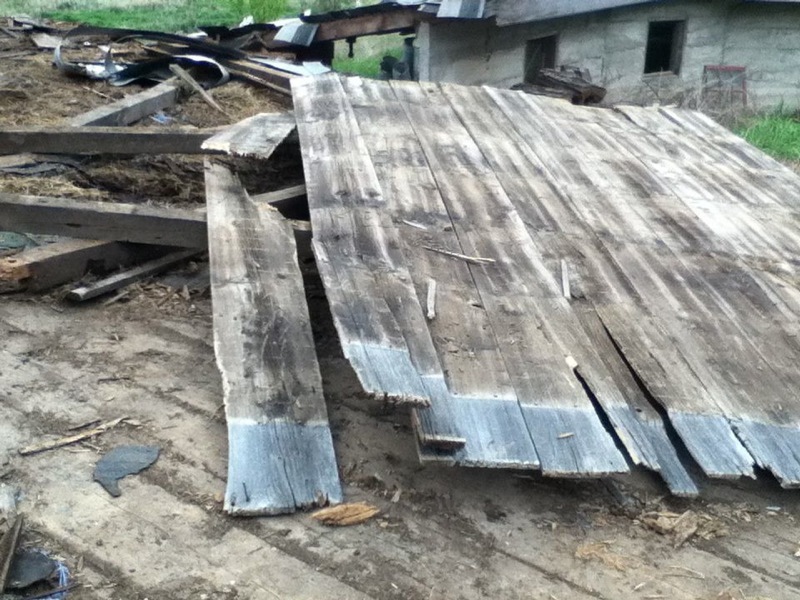 I 'processed' each of these sections one at a time by pulling it to the edge (by the trailer) where I could work on it in safety and on a flat surface (the old barn floor). i would first loosen up each section by bouncing it around with the pallet forks on the tractor loader. This would break a few of the roof boards but there were so few of those that were completely free of rot that the time this step saved was more than worth it in the overall scheme of things. 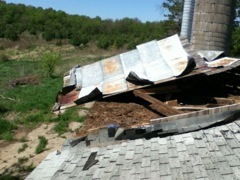 After loosening I would attack what remained with hammer and pry bar (and potato fork for the shingles). It seemed like this process would never end but eventually I got the last piece dragged to the edge and pulled apart. Mixed in the rubble were many nice beams (not as many as you'd think for a building this large). The recovery of each of these beams was a nice respite from the tedium of the roof. One of these beams spanned the entire width of the barn (35 feet) in one piece. This must have been a beautiful tree. I'm finally ready for the remaining walls. What happened here is that when I pulled the rest of the barn down, the parts where I had NOT removed the siding (boards and tin) remained standing and, more or less, intact. I am convinced that what remains standing is quite stable since it has withstood the winter winds and spring storms. The geometry of the remaining structure is also a problem. What I'd like is to pull it towards the inside of the barn because if it goes out it will fall 10 feet onto a concrete apron below with the inside of the wall up (these walls still have the tin siding attached and having the walls land with that facing down would make it almost impossible to remove intact (in a reusable form). But trying to pull it inward would be pulling it against it's strength since the side walls were holding up the end wall. And pulling the side walls first would risk the end wall falling outward and down to the concrete below. 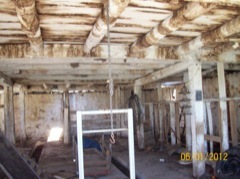 The answer came to me when I brought in a ladder and was inspecting the beams that ran along the tops of these walls. 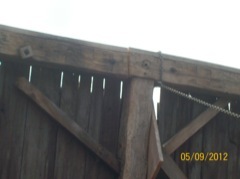 The long beam that spanned the long wall was spliced in the middle. This splice had been reinforced at some point which told me that there was some problem with the wood. So I decided to cut this beam in the middle and connect a chain around one side of the cut and give it a pull. My hope was that the long wall would fold in at the center which would pull the corners - and the side walls - inward and lay themselves out neatly onto the deck of the barn floor. (My first hope was that the wall wouldn't decide to collapse while I was up on that ladder with the chainsaw). The pull went just as expected. The center folded and the siding boards and tin held things together enough so that the side walls were pulled inward at the corners. The wall folded upon itself with a large portion hanging over the edge in a cantilever sort of thing. The tin siding held everything together so that the whole thing in one long 'wave' with the inner 'skeleton' of 4X4's pulling away and staying intact. 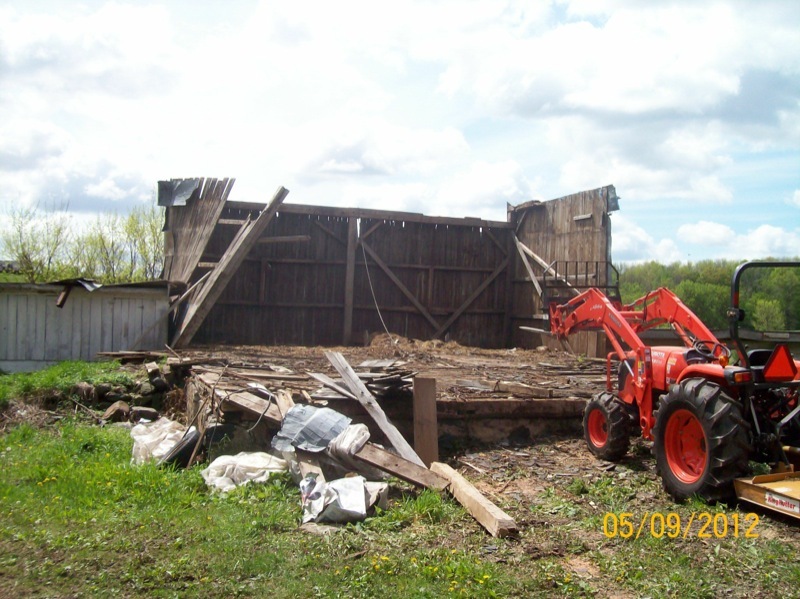 Taking apart the last of the barn walls. All the walls came down with the tin-side facing up. This was just as I wanted because I could now peel the tin pieces away (in salvageable form) and then recover the siding boards intact. This picture shows the situation after I have disassembled and removed most of the east wall and half of the south (long wall). As you see this section is hanging half over the edge with a 10 foot drop to concrete below. I had no desire to work on this while it was balancing here. This picture shows the south wall rising in the distance to the corner between it and the far side wall. This corner had held together when it went down and the wall folded over upon itself - in an 'S' shape. Flattening the 'S' and making it safe to work. Since everything seemed to be attached, I connected a couple chains to what was the end of the short side wall (west wall) and gave it a pull. Since it was laying on the flat floor of the old hay mow, it pulled without hitch. The fold straightened out and the whole wall and it ended up flat and no longer hanging over the edge. As you see here. What remains is to pull off the tin sections of the siding. 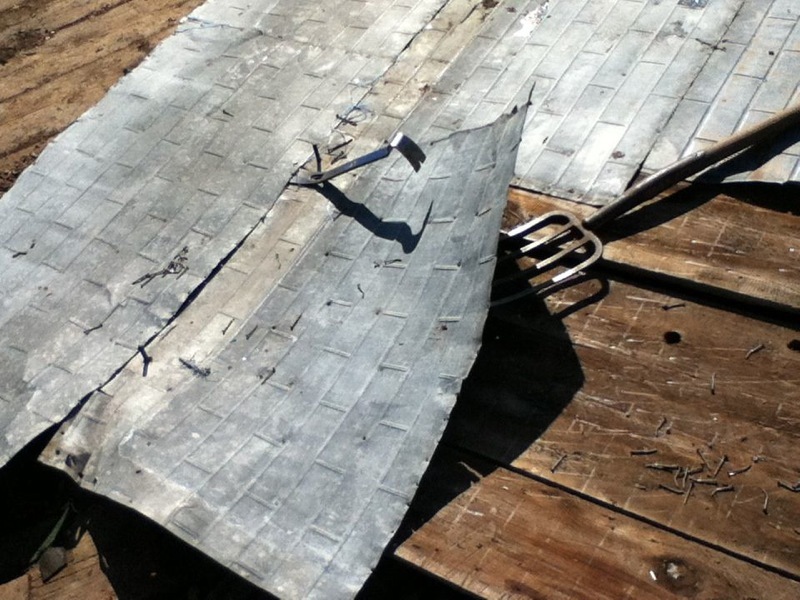 Because the tin held everything together, nearly all the siding boards were completely intact. I was trying my best to do it in such a way as to minimum any damage to both the tin and the underlying siding boards. The tools of choice were this flat bar and the potato fork. I used this same technique when I was on the ladder during the first stage of the take down. It was much more 'comforting' to be standing on solid ground. The nails holding the tin are still bend over on the other side of the siding boards. I had considered straightening them before pulling down the walls but decided it was both too dangerous and past the point of diminishing returns. So, many of the nails just pulled through the tin but the heads were small and the holes were not that much bigger. If I re-use this tin I can use nails with slightly larger heads. Under the tin are one inch siding boards and they are all 16 feet long and range from 8 inches to 30 inches wide. Amazing to think that this barn was built at the turn of the 20th century and these boards came from another building that had probably either been blown down or had been torn down. So these boards may be over 150 years old. Not ancient in terms of trees but pretty good in terms of building materials. They certainly date back to the days of the original logging of this area's land and can be classified as coming from 'old growth' trees. Once the tin is removed you can see how much it had protected the wood by looking at the near end. This was the top of the south-facing wall and had either lost it's tin or had never had it. 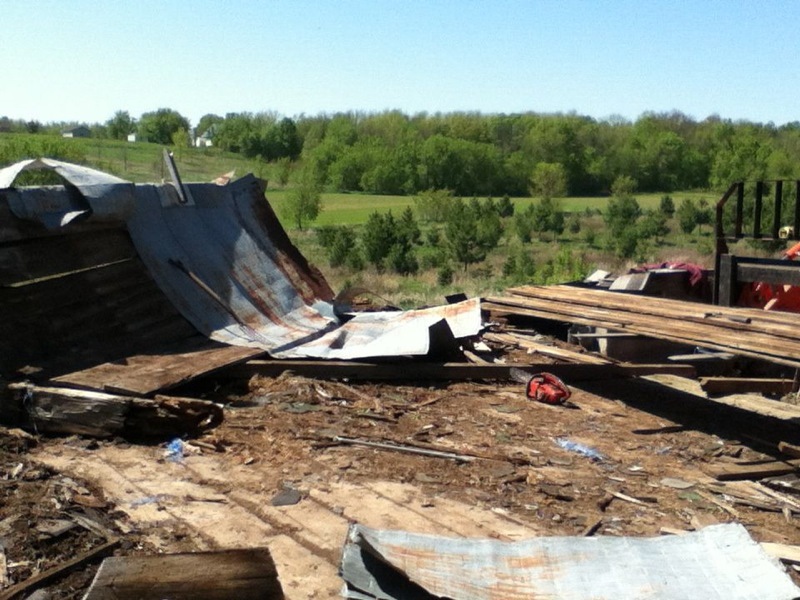 Maybe this blew off in the tornado - along with the roof - and wasn't replaced. (please click on picture for closer view). This preserving effect is good news for re-using the boards for some other construction project, but maybe not so good if I was interested in selling them for crafts and such as weathered barn boards. (oh well). 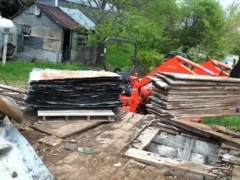 Once the tin is removed from the siding these boards are just sitting there and can be lifted up and stacked. 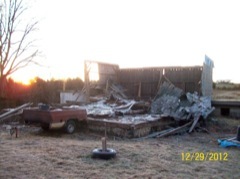 Any backing - beams and joists - have fallen away during the collapse. 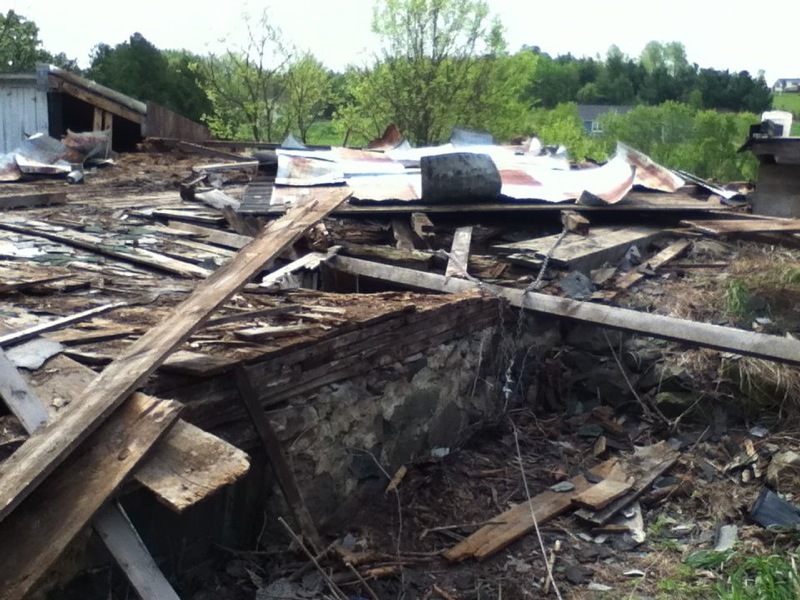 As I have said, the tin siding was pretty much all that was holding everything together. Next step - the basement. Now that the top of the barn has been taken down, it's time to start work on dismantling the basement. There is a lot of staining on these boards and rafters because of the rain and snow melt through all the rotten hay and whatever that was laying under the roof pieces last winter and this spring. This is why I was hoping to have that all cleaned off before winter. But it is all superficial and makes things look worse than they really are.